It is always great to see the present collide with the past. President Obama’s campaign speech in Osawatomie, Kansas yesterday left me scratching my head, and those who know me will agree that I must scratch a lot since I don’t have much hair left. He spewed his usual class-warfare rhetoric as he tried to link himself with President Teddy Roosevelt who made a famous speech in the same town in 1910. The only problem is that this is the same town that has a bloody history thanks to its infamous resident John Brown. In 1856, Brown didn’t like the pro-slavery politics of some of his neighbors. Not one to let the law stand in his way, Brown and his sons lopped their heads off – literally. Five men murdered! Brown and his sons then escaped to Canada to avoid a hangman’s noose only to reappear on the national scene three years later to lead the attack on the Federal armory at Harper’s Ferry. Brown did meet his destiny with the hangman, but in the process he created angst for many Southern whites while helping to embolden Northern abolitionists. He and his nefarious clan spread around enough gunpowder which pushed the country closer to the explosion of Civil War in 1861. 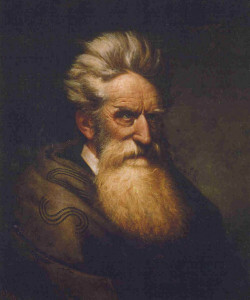 John Brown helped splinter the country in 1859 and Barack Obama is doing his best to divide us today. The parallels are disturbing which makes me wonder what this White House occupier and his campaign cronies are really up to. I am glad to share the below link to show that others who are aware of history did not miss the Osawatomie connection.